, an eminent botanist, who settled in England, was born at Darmstadt, in Germany, in 1681. He was early intended for the study of physic, and had the principal part of his education at the university of Giessen, a city of Upper Hesse. Of all the parts of science connected with the medical profession, he was most attached to the cultivation of botany; by which he soon obtained so much reputation, that early in life he was chosen a member of the Academia Curiosorum Germanise. How well he deserved this honour, was apparent in his papers published in the “Miscellanea Curiosa.” The first of his communications that we are acquainted with, and which could not have been written later than 1715, was a dissertation concerning the plants of America that are naturalized in Europe. The subject is curious, and is still capable of much farther illustration. A diligent inquiry into it would unquestionably prove that a far greater number of plants than is usually imagined, and which are now thought to be indigenous in Europe, were of foreign origin. Besides the most obvious increase of them, owing to their passage from the garden to the dunghill, and thence to the field, they have been augmented in consequence of various other causes, no small number of them having been introduced and dispersed by the importation of grain, the package of merchandise, and the clearing out of ships. The English Flora of this kind, in its present state, cannot perhaps contain fewer than sixty acknowledged species; and a critical examination would probably add greatly to the catalogue. 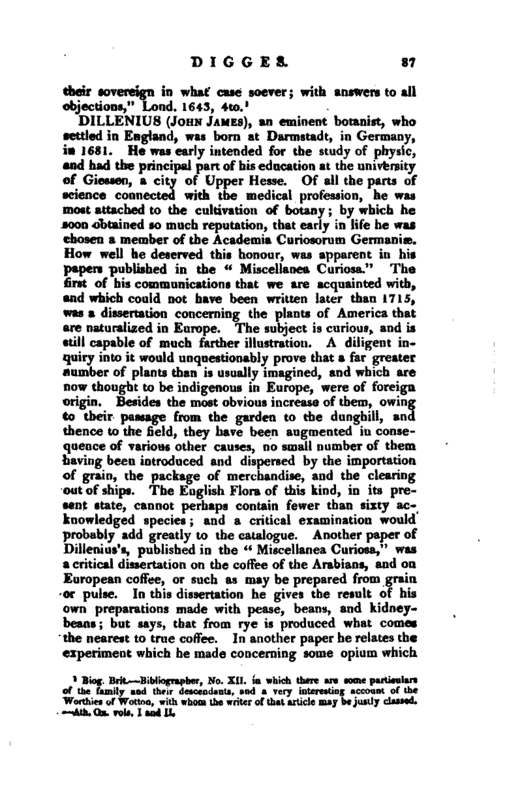 Another paper of Diiienius’s, published in the “Miscellanea Curiosa,” was a critical dissertation on the coffee of the Arabians, and on European coffee, or such as may be prepared from grain or pulse. In this dissertation he gives the result of his own preparations made with pease, beans, and kidneybeans; but says, that from rye is produced what comes the nearest to true coffee. In another paper he relates the experiment which he made concerning some opium which | he had prepared himself from the poppy of Europe growth. In the same collection he shews himself as a / logist, in a paper on leeches, and in a description of t species of the Papilio genus. In 1719, Dillenius excited the notice of naturalists by the publication of his Catalogue of plants growing in the neighbourhood of Giesseu. Nothing can more strongly display the early skill and indefatigable industry of Dillenius, than his being able to produce so great a number of plants in so small a ti. -He enumerates not fewer than 980 species of what w. then called the more perfect plants; that is, exclusiv. of the mushroom class, and all the mosses. By the nu of this performance, the character of Dillenius, us a truly scientific botanist, was fixed; and henceforward he attracted the notice of all the eminent professors and admirers of the science. To this science no one was more ardently devoted at that time in England, than William Sherard, esq. who had been British consul at Smyrna, from which place he had returned to his own country in 1718; and who, soon after, had the honorary degree of LL. D. conferred on him by the university of Oxford. 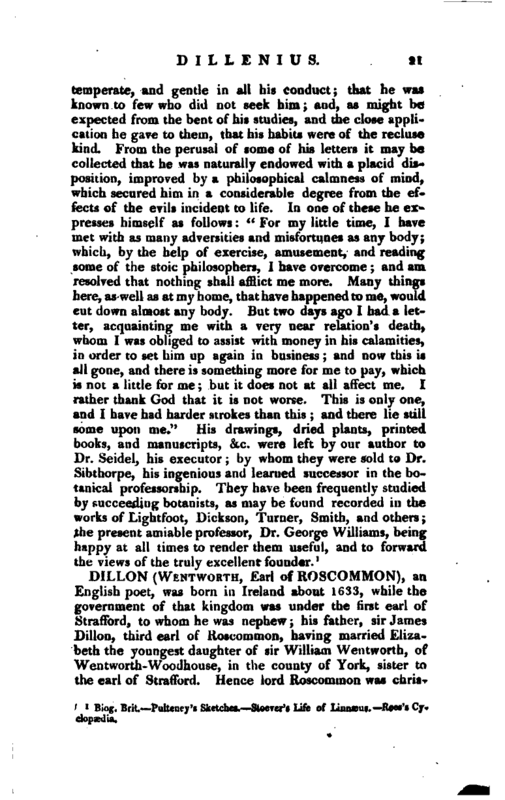 Being particularly enamoured with Dillenius’s discoveries in the cryptogamia class, he entered into a correspondence with him, which ripened into a close friendship. In 1721, Dr. Sherard, in the pursuit of his botanical researches, made the tour of Holland, France, and Italy, much to the advantage of the science; but what in an especial manner rendered his travels of consequence to the study of nature in our own country, was, that on his return he brought Dillenius with him to England. It was in the month of August in the same year that this event took place; and Dillenius had not long resided in England before he undertook a work that was much desired, a new edition of the “Synopsis stirpium Britannicarum” of Ray, which was become scarce. This edition of the “Synopsis” seems to have been the most popular of all his publications. This good opinion was not at first reciprocal. According to the account of their first and subsequent interviews, Dillenius did not exhibit those proofs of a liberal mind which might have been expected from one who had himself been indebted so much to the liberality of others. See Stoever’s Life of Linnæus, p. 90, et seqq. But the ingenious writer of his life in the Cyclopædia, observes, that although Dillenius was previously rather unfavourably disposed towards the reformations and innovations of Linnæus, as tending to create difficulty and confusion in the first instance, he soon forgot all such prejudices, and these two great men became mutually attached, as honest liberal cultivators of so liberal and pleasing a science ought to be. Dillenius wished to fix Linnæus at Oxford, as his coadjutor in the Pinax; and if sir Hans Sloane had been equally discerning and equally liberal, the illustrious Swede might have been naturalized amongst us. 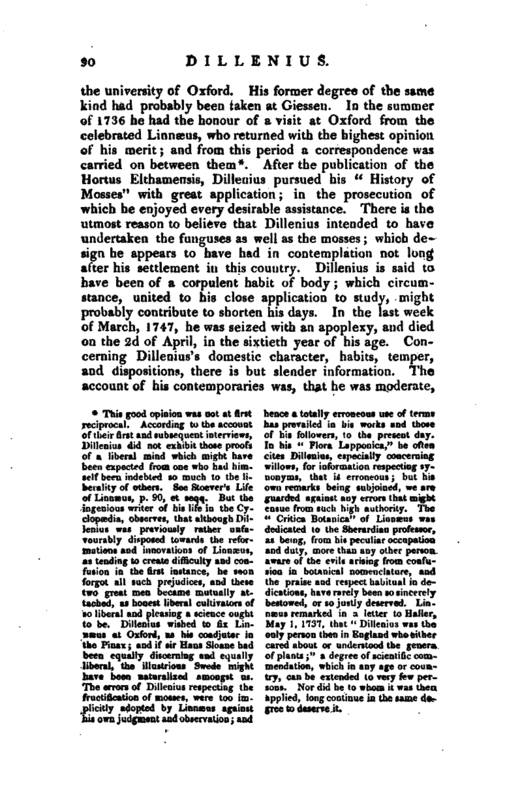 The errors of Dillenius respecting the fructification of mosses, were too implicitly adopted by Linnæus against his own judgment and observation; and hence a totally erroneous use of terms has prevailed in his works and those of his followers, to the present day. In his “Flora Lapponica,” he often cites Dillenius, especially concerning willows, for information respecting synonyms, that is erroneous; but his own remarks being subjoined, we are guarded against any errors that might ensue from such high authority. The “Critica Botanica” of Linnæus was dedicated to the Sherardian professor, as being, from his peculiar occupation and duty, more than any other person, aware of the evils arising from confusion in botanical nomenclature, and the praise and respect habitual in dedications, have rarely been so sincerely bestowed, or so justly deserved. 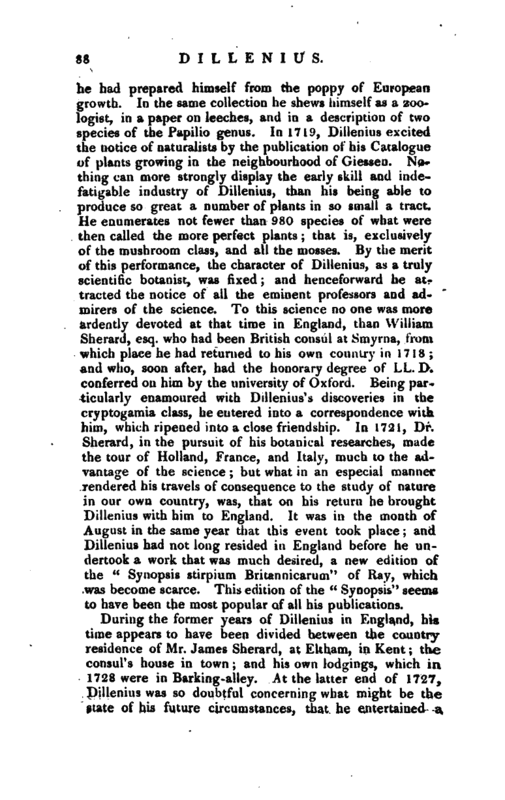 Linnæus remarked in a letter to —Haller, May 1, 1737, that “Dillenius was the only person then in England who either cared about or understood the genera of plants” a degree of scientific commendation, which in any age or country, can be extended to very few persons. Nor did he to whom it was then applied, long continue in the same degree to deserve it. Biog. 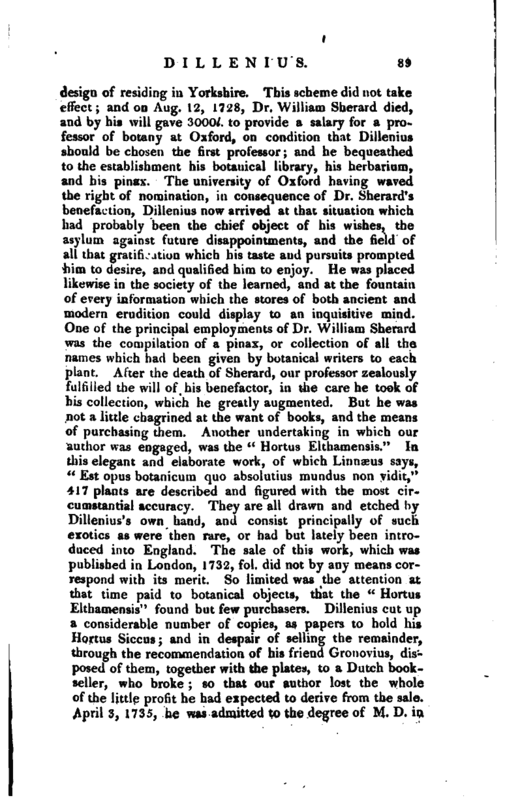 Brit.—Pulteney’s Sketches.—Stoever’s Life of Linnæus.—Rees’s Cyclopædia.